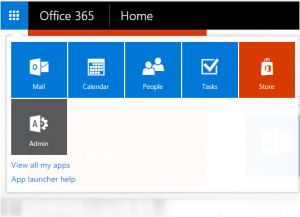 By designating Nero Blanco as your Office 365 Partner, we receive financial support from Microsoft that enables us to provide you with assistance in creating a new Office 365 tenant, migrating to Office 365 and supporting you once you are on Office 365. 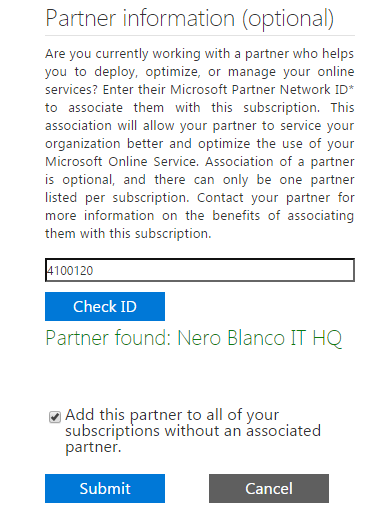 Designating Nero Blanco as your Partner does not cost you anything, does not give us access to your data, and has no impact on the support you can already receive from Microsoft. Naming Nero Blanco as your Office 365 Partner is easy. It only takes moments and you only have to do it once. 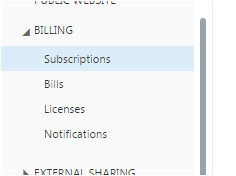 2. in the left column, expand Billing click Subscriptions. 4. In the Microsoft Partner ID field input 4100120 and click Check ID. Nero Blanco IT HQ should be displayed. 6. 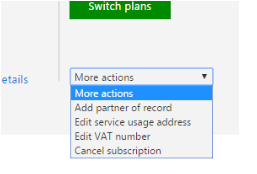 Repeat steps 3 – 5 for each Subscription you have.